Yes, I just made up that headline's word. But, this qualifies completely. Part of my vacation involves a party with a bunch of friends. These friends play World of Warcraft so a sort-of WoW-themed party is in the mix. What kinds of things would qualify for a Warcraft-themed party? Well, we have to utilize Kelly green. That is the color of the guild tabard. 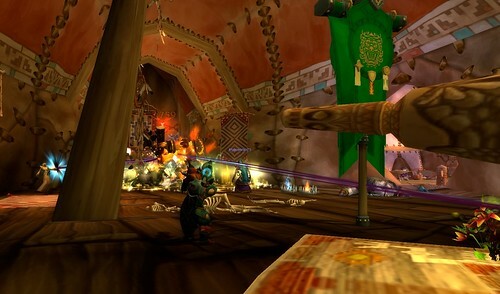 The guild standard is to the right in this screenshot of us taking down one of the horde leaders, Baine Bloodhoof. I like this leader and it's kind of sad to have to kill him for this one achievement. That's a completely different blog post, good and evil in a fake universe, but you can see the colors with our icon which we have proudly worn since December of 2007. My guild loves to make bacon comments. We have the bacon angle covered. Chocolate is a necessity and that's covered too. We're doing something with regards to the whale sharks that swim in sections of the ocean and who won't think twice about eating you, unlike the real-life shark who eats only krill. I was discussing the food with Jon and he wondered about a bacon pinata. Well, you can get pig pinata's and there are tutorials for making your own. As I was poking about in pinatas, I stumbled across this. It's a dragon! 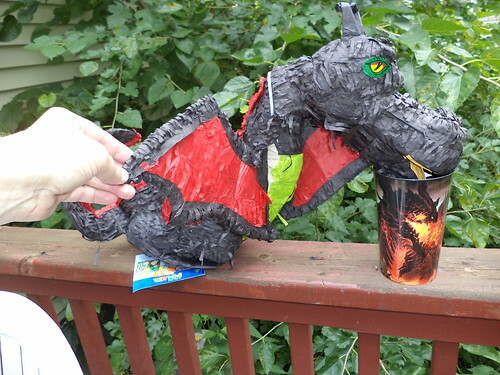 More specifically, see the cup on which the dragon rests? That's Deathwing, the "star villain", if you will, of the previous content introduced in 2010. He is a black dragon with lots of fire and red and orange and yellow. 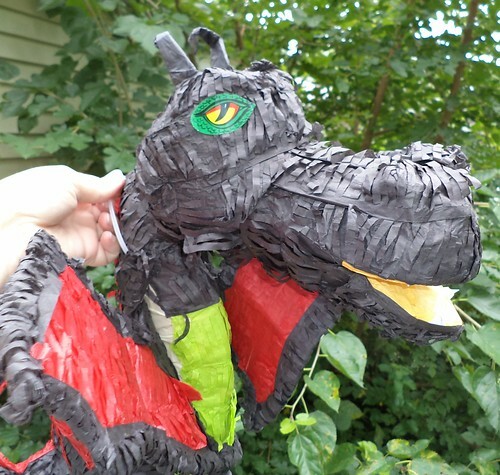 A black dragon pinata? Why absolutely! There are kids coming with their game-playing parents. We'll let them get a whack at this first. He doesn't hold all that much in candy, but, in a way, that's not the point. We WOW players will get a first-hand crack at hitting the real dragon we hit merely in pixels. If that's not awesometastic, I don't know what is.